Apple’s announcement Tuesday brought with it many innovations across the span of tablets, notebooks, and workstations. Apple introduced the new iPad Air, updated the iPad mini, redesigned the MacBook Pro, and provided more information on the Mac Pro. 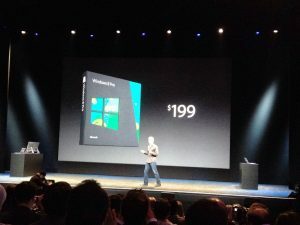 I attended Apple’s event, and one announcement that didn’t get much attention until Microsoft’s blog is that much of Apple’s key tablet and personal computer software is now “free”. Over the long-term, I believe this could have an impact not only on Microsoft, but its OEM partners, too. Let me start with what Apple announced. Yesterday, Apple announced that with the purchase of every new iPhone, iPad, and Mac, OS upgrades, iLife and iWork will now be “free”, or downloadable and usable for no charge. Think about that for a second…. Free, high-quality operating systems, lifestyle, and productivity software across phone, tablet and notebook and wo rkstation. Consider for a second that it costs $120 to upgrade from MS Windows 7 or Vista to Windows 8.1 and an MS Office 365 license costs $99 per year or $300 over a three year period. I believe this will make a difference to desktop software in the long-term. From a tactical point of view, this reduces the Apple premium price for the premium experience. Let’s consider the new 13” MacBook Pro. What was once $1,299 could now appear $879 if you factor in three years of MS Office and one major MS operating system upgrade. This is a TCO basis that may be more appropriate for businesses than consumers, but does comprehend the potential full costs. I don’t believe this will immediately be comprehended in consumer’s or businesses value proposition, but I do think overtime, it could. Now let’s look at this strategically. Microsoft has diversified over the last decade into enterprise software and services, but Office and Windows, including upgrades, are still cash cows. Enterprises don’t pay list price for OS upgrades or Office, but based on MS’s profit margins, there is still a lot of “room” to work. And it’s that “room” that Apple intends to pierce based on today’s announcements. Consider for a minute what the MS world would look like to Microsoft’s customers and partners with the expectation of free OS upgrades and free Office. Apple is essentially commoditizing OS upgrades and productivity software. The PC software industry has already has been impacted by the mobile world and I don’t see this stopping anytime soon. In fact, Apple’s announcement exasperates the issue. PC software and services like Windows upgrades and Office will continue to look more expensive year after year. So what does this mean to MS’s partners? MS OEMs like Dell, HP, and Lenovo now must consider the entire value proposition with PCs with Windows and MS Office. Consider that OEMs do drive revenue selling Office. Just look at how hard they pressure sell you in on-line configurators. OEMs recognize that Office is the business standard, but how do you deal with a “free” cloud and client offering from a credible brand like Apple over the long haul? Free MS Office productivity alternatives to Office have been available for 20 years, but this time, it’s different now. PC software that costs a lot of money looks odd when compared to low cost mobile and freemium models. As I said before, over time, I believe buyers will be less likely to pay as much as they do today for PC software, look more closely at the alternatives. This creates a big challenge for Microsoft. I believe that OEMs, because of the vanishing software opportunity, just have one less reason to connect themselves to Microsoft and more strongly expand their opportunities with alternatives like Android, Chrome OS, and Linux. This transition has already started when you look at Dell’s, HP’s and Lenovo’s products, but Apple just gave OEMs another reason to invest more into the alternatives. Net-net, Apple’s “free” software announcement will hurt Microsoft, starting with consumer, then bleed over to education and small business. I don’t think this will have much of an impact to medium and large enterprises because Microsoft has money to move around (Exchange, SharePoint, Windows Server, Lync, etc.) but will certainly come up in Microsoft price negotiations.